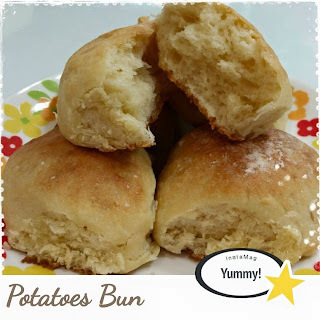 When I saw this recipe from MiMi Bakery House, I was so curious if potatoes really could be used to make bread and yet still have the softness. Indeed it came out so soft with a slight sweet taste. When I let my dough to proof for the first time, it did not really rise double in size which I knew something might gone wrong. However, I still proceeded with making the dough into round balls and let it proof the 2nd time. It did not rise double as well but after baked, the bread turned out into a nice shaped bun. The bun goes so well just alone with butter and within seconds my kids gobbled up a few buns. I had kept a few buns till the next day to test out the texture, it was not as soft as yesterday but good with just a minute of microwaving. Thanks to MiMi Bakery House for sharing this wonderful recipe. 1. Place flour, salt, milk powder, yeast & sugar in mixing bowl and mix well. 2. Add mashed potatoes, potato water & egg. Knead to form a dough. 3. Add in butter and continue kneading for about 10-15 mins till you get a smooth & pliable dough. Put the dough in lightly greased bowl and proof for 1 hr. 4. Punch the dough to expel air and divide dough into round balls. 5. Arrange dough on baking tray and allow to proof for another 45 mins till they double in size. 6. Dust the dough lightly with some flour and baked in preheated oven at 180 Deg C for about 15 mins or until golden brown top.